Monday, 11 February 2019, 6:42a.m. A bride who advertised for a student to take her wedding photos for free says a man who objects to her approach has urged people to assault her. The story of her post, covered by The Herald on Thursday, had "gone viral all over the world". The Christchurch woman, who asked not to be named, said she had received many negative comments in response to her ad on a Facebook buy/sell/trade page - and some positive ones, as well as private messages from people "wanting to take up the opportunity" to take her wedding photos. 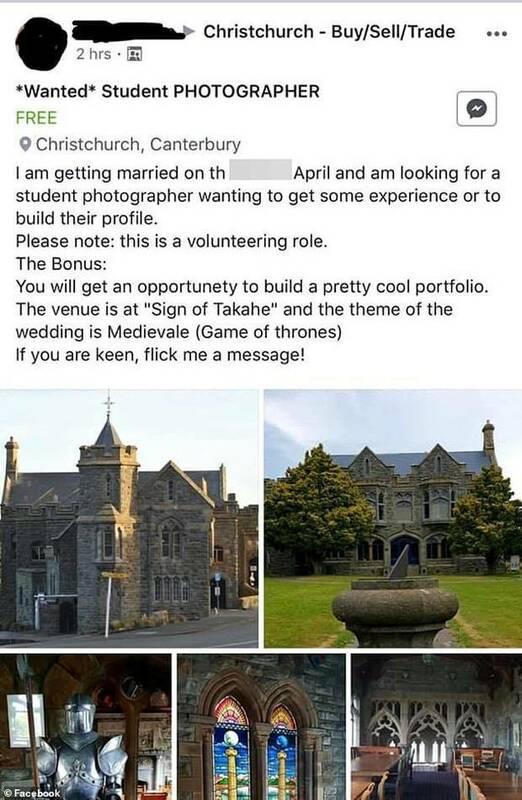 Among the negative comments, the responses from a Christchurch photographer "stood out horribly ... he was really saying nasty things". "At one stage he even posted saying people must wack [sic - whack] me if they see me," the woman said in an email to the Herald. The man - whom she did not ask to take her wedding photos - followed up with threatening notes via Facebook private messages. She told her fiance about the disturbing posts by the photographer, whose phone number was on his listing. He called the photographer, who didn't answer but responded with "very abusive messages". "There were over 50 messages on my partner's phone and they just kept coming." He didn't block the photographer's messages as they "could be evidence if anything happens to me". The photographer started sending messages to the woman's Facebook friends, tried to hack her Facebook page, and threatened to turn up at the wedding. "I guess what bothers me most is, if this fella has done this, how far will he go? When will I need to start fearing for my safety or my kids' safety." The couple are to wed at the Sign of the Takahe, a neo-Gothic castle-like venue on the city's Port Hills, and the theme is Game of Thrones/Medieval. They have been together for two years and have a blended family of seven children, two of whom have left home. "It's been a very long and hard road for us ..."
When they decided to marry, a fortnight ago, they planned to complete the formalities in a registry office. "But then an opportunity came up to have a wedding ceremony at the Sign of the Takahe, a very close friend is a celebrant and agreed to marry us so we thought it would be a great way to celebrate our very special day with most of our friends." Another friend offered to do the cake, a third offered to help with catering, and others agreed to pitch in. "I will be honest - I do not have $3000 for a wedding photographer, and that's at the lower end of the scale." But despite the backlash from her post, the bride-to-be received a number of private messages who were interested because they wanted to build up their portfolio or did it as a hobby. She has selected two students who want to take photos as part of their portfolio and has agreed to let them take whatever shots they wanted. "They are mates and I agreed for both of them just to come along and have fun. Enjoy." The woman, who has been married twice before, will also pay for their fuel and expenses. She only wants photos of the reception which she expected would take less than two hours and hoped to get a couple of nice photos from it. "I'm not really fussed whether they turn out horrible or good as long as someone gets a bit of an experience from it. "I also mentioned to the students that I would like them to be creative and be different. It's a way for them to gain confidence as well as a bit of experience in my opinion." "I had no intention of exploiting students. I was a student once and no-one will give you the 'gap' to do anything risky."